1. 502nd was assigned to be dropped onto Drop Zone “A” and depart from Membury and Greenham Commons airfields in the first wave. 2. Destruction of the four-gun coastal battery at St. Martin-De-Varreville. 3. The capture of “WXYZ” – the artillery personnel’s barracks complex of the Germans at Mesieres. 4. The setting up of strong roadblocks to the north near Foucarville to prevent German reinformcents from moving to the beach area. The night of June 5th, 1944, the 6.670 paratroopers of the 101st Airborne along with their brothers in the 82nd Airborne took off for their jump into darkness in occupied France. After an approximate flight time of 1 hour and 30 minutes, the green went on at approximately 0100 on June 6th and the troopers start to exit the aircraft. Due to a combination of low clouds and heavy ground fire from machine guns and 20mm anti-aircraft guns, only about one-third of the paratroopers are dropped in the correct locations. The rest are horribly scattered from a half mile to more than 15 miles away from their drop zones. Some unlucky paratroopers were drowned after being dropped to late in the English Channel or killed before they could exit the C-47s. During the drop Col. Van Horn Moseley, the 502nd’s commanding officer, broke his leg and had to relinquish command to his executive officer, Lt. Col. John H. Michaelis. The 502nd had the fortune of having their 1st and 3rd Battalions land in the general vicinity of their drop zone, while their 2nd Battalion landed far to the South of their objective near Drop Zone C, as they had honed into the wrong pathfinder signal. Lt. Col. Robert G. Cole, commander of the 3rd Battalion, had dropped slightly to the East of St. Mere-Eglise and started to assemble the small groups of men and walk their way towards St. Martin-de-Varreville and the 502nd biggest objective, the four-gun battery located there. His group eventually numbered around 75 men and included both 101st and 82nd airborne troopers. They were able to made quick progress towards the coast , only encountering 1 enemy convoy, which they quickly ambushed, killing multiple Germans and taking 10 prisoners. Upon reaching the outskirts of the gun battery, a scouting party was dispatched to determine enemy strength, only to find the gun battery had been decimated by allied bombing and abandoned. This allowed Lt. Col. Cole’s forces to turn their attention to the next objective, the seizure of upper causeways or exits 3 and 4 from Utah beach. Using anything they could find, from fences to deceased animals, Lt. Col. Cole’s forces laid in wait for the enemy. At 0930, the enemy began retreating across the causeways en masse right into the jaws of Cole’s forces and approximately 50 to 75 Germans were cut down. Finally at 1300 hours, the 4th Infantry Division made contact with the 502nd PIR and Lt. Col. Cole’s forced were placed in reserve. Above Left: 101st Airborne Troopers await takeoff. Above Right: 502nd Pathfinders plane #1 with Capt. Frank Lillyman Commanding. Lillyman has been credited with being the first man to land on D-day. Lt. Col. Cassidy, 1st Battalion’s commander, also had a successful drop and landed in the center of the battalion zone near the town of St. Germain-de-Varreville. He quickly gathered a small force of his own and set out towards the barracks for the four-gun battery, known as the WXYZ complex. Securing the crossroads West of where the barracks building stood, Lt. Col. Cassidy’s men linked up with an additional force of 45 men, mostly of the battalion, and ordered them to establish a defensive line at Foucarville, a position directly to their North. After placing the bulk of his men into reserve to protect any additional German reinforcements from gaining access to the beaches from his West, Lt. Col. Cassidy dispatched 15 men to clear the barracks in the WXYZ complex. About 150 Germans were killed or captured after the all of the buildings had been cleared, the bulk of the clearing has been credited to S/Sgt. Harrison Summers, who bull rushed buildings one by one, kicking in doors, spraying his Thompson submachine gun and tossing in grenades. He was assisted by others, but his determination and never ending drive proved to be the difference. Lt. Col. Michaelis and some 200 men arrived near the end of the barracks clearing and linked up with Cassidy’s forces. The skirmish line at Fourcarville had turned successfully into establishing 4 roadblocks in and around the town, trapping and nearly destroying a four vehicle enemy troop convoy. 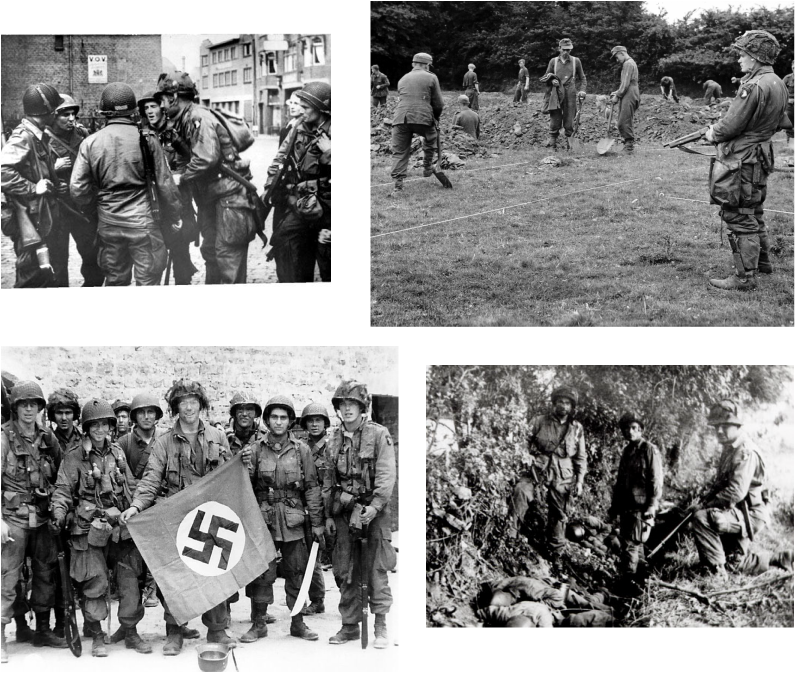 At the end of June 6th, 1944, all objectives of the 502nd PIR were accomplished, and they are credited to be the only Regiment to have done so. The 502nd PIR was greatly assisted in the fact that the allied bombing had already destroyed the four-gun coastal battery. 2nd Battalion of the 502nd, commanded by Lt. Colonel Steve Chappuis, was not mentioned by name above, but was part of the mixed forces used in accomplishing their objectives. By the end of D-Day the 502nd had the bulk of their force re-assembled and linked up with their Unit. Now that Allied forces has successfully made landings in France and secured a tiny foothold in Europe, they now had to start connecting their beaches, and push further inland. 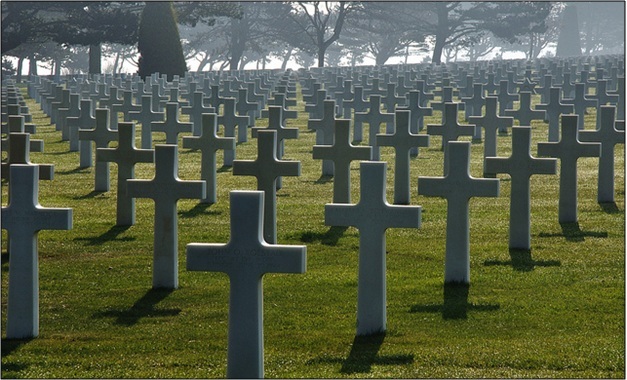 For the Americans it was linking Utah and Omaha beaches. 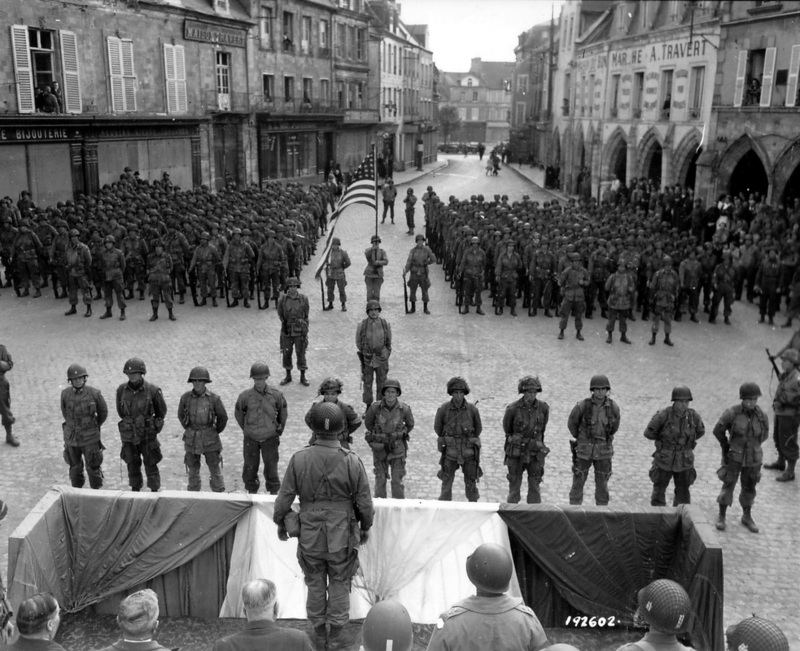 Their first step was the town of St. Come du Mont and would involve the use of 4 battalions; the 1st and 2nd Battalions, 506th PIR, the 3rd Battalion 502st PIR and the 1st Battalion 401st GIR. The attack was launched on the morning of June 8th and by June 10th town was completely encircled and cleared of enemy forces. The drive now focused on Carentan and along the N13 Highway. The plan called for the 502nd PIR to travel the Carentan Causeway, which was affectionately called Purple Heart lane, take the town and set up a blocking position to the South to prevent any reinforcements or counterattacks. This plan was to be relatively easy because the town was believed to be abandoned due to allied bombing and signs showed the Germans were pulling back, most likely to mount a large counter attack somewhere else. To add to the difficulty the Carentan Causeway was elevated 6 to 9 feet above the marshlands of the Douve River and contained four bridges. The marshlands had also recently been flooded by the German army, forcing any advance to be out in the open. Of the four bridges, one had been partially destroyed by the Germans. Engineers had attempted to make repairs to the bridge, but due to constant small arms fire, they were unable to make any progress, and delayed the start of the attack. On June 10th, the 3rd Battalion 502nd Parachute Infantry stepped off for their attack in the afternoon. Walking single file, the men did the best they could to crouch low or crawl to avoid incoming rounds. Advancement was slow and took 3 hours to cross 3 bridges of the Causeway. Approaching the 4th bridge would prove suicidal, as a Belgian gate had been drawn across the road, forcing the men to squeeze by the obstacle one trooper at a time. They were also now in ranch of machine guns and increased rifle fire from farmhouses and hedgerows. Mortars were called up to help target enemy positions, but still progress was slow. After midnight, the men were bombed and strafed by an enemy fighter, causing several casualties and injuries. Determined to keep going, 3rd Battalion was finally able to get 3 companies through the gauntlet and deploy on either side of the road. Lt. Col. Cole located the center of opposition to a large farmhouse and called for artillery to knock the house down. Unfortunately, continued efforts failed to knock out the house and continued fire on the men increased. Lt. Col. Cole made the decision to launch an all-out offensive towards the farmhouse and ordered the men to fix bayonets. When Cole’s whistle blew, he rushed forward towards the farmhouse. Many troopers didn't immediately hear the whistle or react immediately, leaving Lt. Col. Cole with his .45 M1911 A1 exposed and alone out in front. Upon reaching the farmhouse, the troopers rushed inside, quickly clearing the farmhouse and establishing it as the new command post. The intense fighting continued from the surrounding areas and multiple German counterattacks were launched to regain the lost ground. All failed as 1st Battalion 502nd, was sent to assist and secure 3rd Battalions flanks. This historic day long fight exhausted the 502nd PIR’s men and resources and the 506th PIR was called in for the assault on Carentan the next day. Lt. Col. Cole was cited to receive the Congressional Medal of Honor for his actions that day. Sadly, Lt. Col. Robert G. Cole would never wear the medal because he was killed by a snipers bullet 3 months later in Holland. The 506th was able to occupy the city after light resistance, the Germans seeing the fierce determination of the 101st Airborne, had already started to pull back their forces for a counter attack. The counter attack would come on June 13th against the 506th PIR lines and include the 2nd Battalion 502nd and become known as the battle of bloody gulch and bloody gully. 506th in formation after securing Carentan. On 29 June the 101st was relieved from the front lines and sent to Cherbourg to relieve the 4th Infantry Division. The 502nd PIR returned to England shortly after for rest and training and replacements. In August 1944 the First Allied Airborne Army, controlling elements of the American and British (and Polish) Armies was created by General Eisenhower. The 502nd PIR was assigned to the newly created U.S. XVIII Airborne Corps under the command of Gen Matthew Ridgeway and eagerly awaited their next mission.